Originally I wasn't going to write anything about Natasha Richardson, mainly because I felt I would only be reporting the news and not having anything to add. And while I'm not going to report on Ms. Richardson's medical condition, per se, because I think that has been reported on ad nauseum, I do want to say that while Ms. Richardson has certainly left behind a wonderful legacy with her body of work and, more importantly, her two sons, I also think she left a perhaps unintentional legacy of living a loving, full life and grasping every moment while you can. 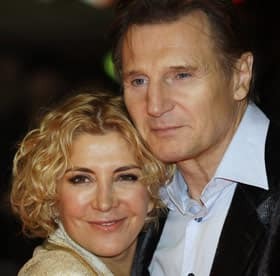 If you're like me, you felt shock upon hearing of Ms. Richardson's demise at a young age and then sympathy and sorrow for her devoted husband, Liam Neeson, and their children. But what really stays in my mind is the fact that the week before her accident, even a day or hours before, she was living her life, going about her business, with nary a thought of being separated from her family. What happened to Natasha Richardson could happen to any of us, at any time. So live your life now, be happy and enjoy every moment you have with your loved ones. Natasha Richardson did.